advoCATS volunteer base cares for feral cat colonies on Hawaii’s Big Island. When guests pull into the parking lot at Hilton Waikola Village or Anaeho’omalu Bay in Waikoloa on the Big Island of Hawaii, they are often surprised by the abundance of cats in the area, so much so that some will go and purchase cat food or leave their dining leftovers for the animals. However, for the group that attends to these cats, advoCATS, that is not what these felines need and there is signage to effect clearly asking people to not feed them, advising they are looked after. While that may seem an odd request, the reasons are simple. By feeding a colony in a singular location the volunteers are more easily able to capture animals for spay/neutering or to attend to observed injuries or illness. The volunteers also provide water as there are no sources of natural drinking water on the Kona side of the island. These amazing volunteers not only feed, water, and care for these felines they also pay for all the required supplies on their own. That is a huge commitment on the part of the volunteer to assure needed care of the population is addressed. Sadly, many of these cats were once people’s pets who, when moving or just no longer wanting them, dropped them off in the hotel parking lot or over at the bay. 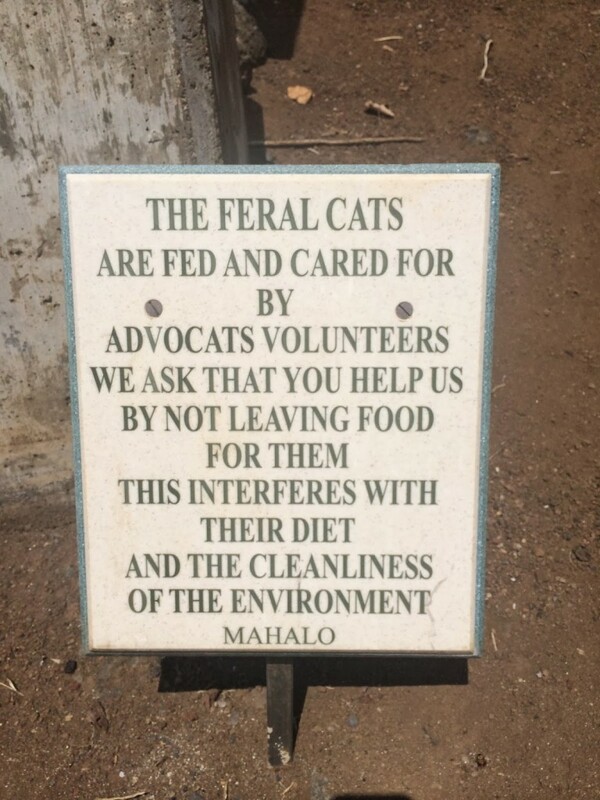 advoCATS learned, and continues to learn, of these feline colonies, which are not by any means isolated to the Waikoloa area, through concerned citizens and members who advise them of the location. Employing the Trap-Neuter-Return program to keep the populations down and for the cats’ health and well-being, spaying and neutering is done at a local veterinary hospital or an available clinic. advoCATS provides such spay/neuter events often and as of November 2015 have spayed and neutered 17,869 cats since March 17, 1999. The animals also are vaccinated, treated with Revolution, and following their recuperation and taken back to their colonies where volunteers keep an eye on them during the recovery phase. Cats, nor any pet for that matter, are not disposable. What advoCATS does on a daily basis for these feral feline populations is remarkable and deserves much support for its good work. As with any volunteer organization the donation of money, cat food, equipment, and time is an on-going request, but what they deliver with what they can provide is nothing short of life-saving for so many of these animals. You need only spend time down at Anaeho’omalu Bay to see both the impact of what they do for these feral feline populations and the tremendous need for it to continue. To them we say mahalo nui loa.